EOGHAN STOKES revealed that Derry City Football Club came highly recommended to him by several of his ex-Bohemians teammates. 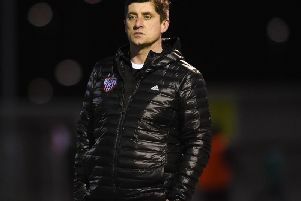 The 22 year-old former Leeds United forward impressed Declan Devine when the Derry boss was a pundit at pitchside for RTE in the Dublin derby in Tallaght last August as Stokes grabbed the winner for Bohs in front of 4,150 fans. Devine believes the player has a ‘bright future’ in the game and was delighted to snap him up in a deal which quickly gathered pace over the last few days following a meeting in the CityNorth Hotel on the outskirts of Dublin. And while the City supremo gave Stokes the big sell when unveiling his plans for the club, it was the advice from three former Derry players which helped seal the deal. Former fans’ favourite at Brandywell, Keith Ward, Rob Cornwall and Paddy Kavanagh, who all spent time on Foyleside over recent seasons, gave their seal of approval on the city when Stokes told them he was considering a switch. “I’m delighted it’s finally done so I can get into training and start the campaign next week, hopefully it will be a good one,” said the Dubliner. Stokes celebrates his winning goal in the Dublin Derby against Shamrock Rovers last season. “I’ve been at Bohs last year and have a few mates who have been up here playing at Derry. They couldn’t talk highly enough about everything about the club, the facilities and the city itself seems great. Anyone I’ve talked to about the city has said it was a great spot so I’m looking forward to it. Stokes, who can operate as a No. 10, from a wide position or in midfield, was recently contemplating a move to Portugal and spent time on trial with Boavista in the Portuguese top flight during the League of Ireland off-season. A former Republic of Ireland U19 international, Stokes had his contract with Leeds United terminated by mutual consent in February 2018 having made just one first team appearance in a Carabao Cup clash against League Two side Newport County. New Derry City signing, Eoghan Stokes. He felt it was time to move on after growing frustrated with the lack of first team opportunities and the constant chopping and changing of managers at Elland Road which, he felt, hampered his development. Stokes made an instant impact when signing for Bohemians, scoring in his second appearance in a 1-1 draw against Limerick. In total he scored five times in 31 league appearances for the Gypsies last season. And now he’s hoping he can have a bigger impact with the Candy Stripes and help push the club back into contention for the European places. “I scored five goals in the league and had three or four in the cups so hopefully I can score more goals up here and we can have a good season and push as far as we can, maybe get Europe or see how we go. “I was in Boavista for 10 days and it was an enjoyable experience. It’s a massive club but the circumstance just didn’t suit me at the minute. But it’s good to be here now. For his part, Devine believes he has a player who will excite the fans. “He’s a very talented boy. He was very unfortunate not to still be at Leeds United. I was impressed by him last year having watched him numerous times with Bohemians and he will add a lot of attacking qualities moving forward. “He’s a player who I feel will also excite the people in the Brandywell and is a player who I feel has a very bright future ahead of him.